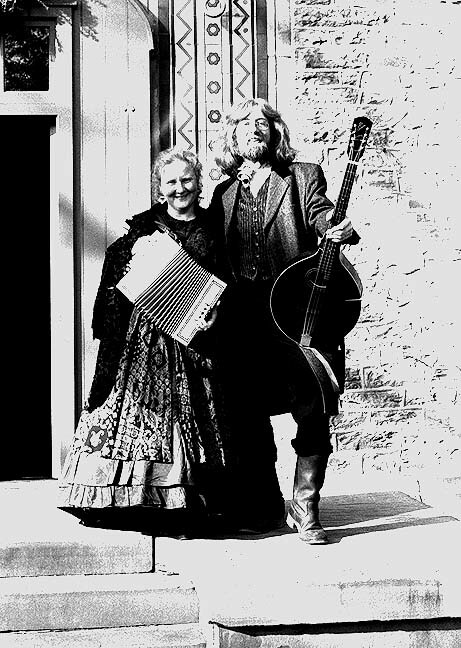 "Bells & Motley Olden Music, Dance, Storytelling and Pageantry Programs for Historic Sites"
The musical duo Bells & Motley brings historic music, dance, theatre, and pageantry to life. We are known for programs that are warm and interactive, with broad appeal to audiences of all ages. 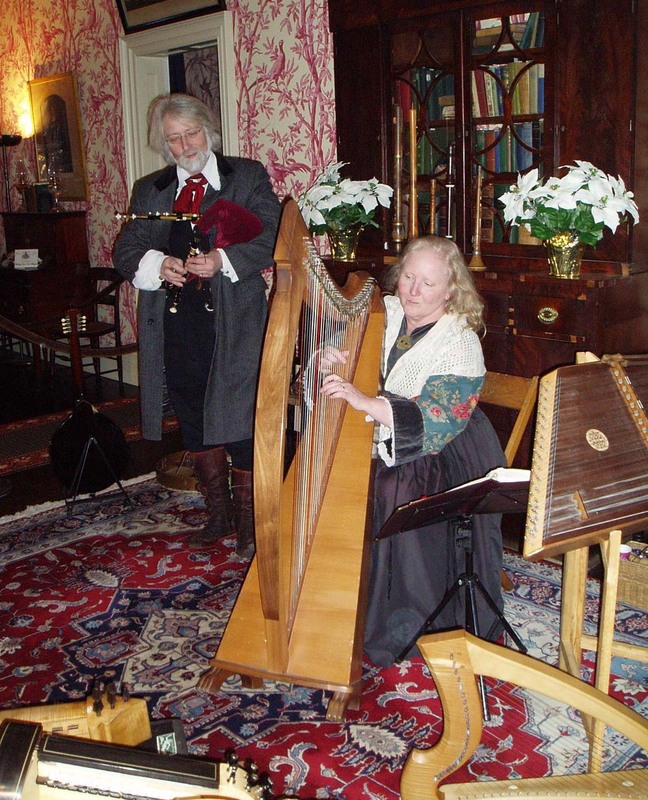 From rustic & robust music performed on early bagpipes, hurdy gurdy, and button accordeon, to more sophisticated settings on lute, harp, recorders, fiddles, and more... audiences delight to discover that historic music not too esoteric for modern ears! 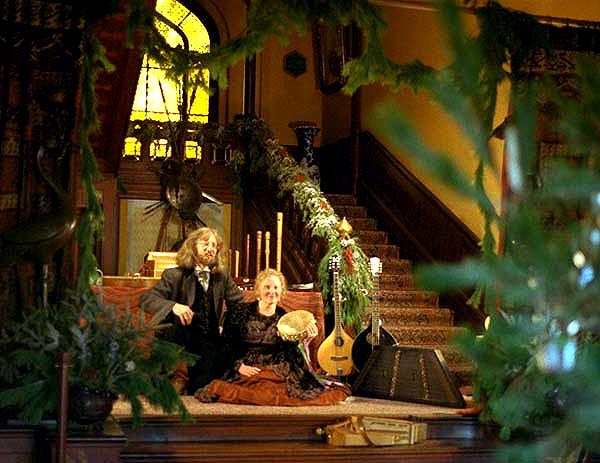 JOHNSON HALL STATE HISTORIC SITE In 2001, Bells & Motley first teamed up with Wanda Burch of Johnson Hall to offer a pairing of performances with an eye towards attracting new audiences and appreciators of history. First, on Saturday afternoon in the neighboring village of Glen, the Bromkas performed "Who Has Heard the Wind," a family program of traditional storytelling combined with a mini-concert. The story sought to introduce young people to "times long ago," and also featured a mini-concert on historic wind instruments (recorders, gemshorns, crumhorns, bagpipes...) On Sunday afternoon, the audience was invited back to hear the Bromkas at Johnson Hall for a concert entitled "Bards, Bagpipes, & Rhymers," with friends and relatives in tow! Since that first year, the Bromkas have returned to Johnson Hall for a variety of programs, including teaching historic dances to folks on the lawn, and "St. John's Day" Christmas concerts. LORENZO STATE HISTORIC SITE: JANE AUSTEN BALL COMMUNITY COLLABORATION This wonderful historic site is one of several right in Sondra and John's own backyard, and since 1986 the Bells & Motley Consort has been honored to perform annually in that wonderful upstairs library as part of the Cazenovia community's holiday tradition of "Candlelight Christmas at Lorenzo." The acoustics ring through the entire house, and faithful guests return year after year, saying that Christmas would not be Christmas without this tradition. Lorenzo has sponsored the Bromkas in a number of memorable special events over the years. The favorite so far? In preparation for the event, the Bromkas taught a series of dance workshops. 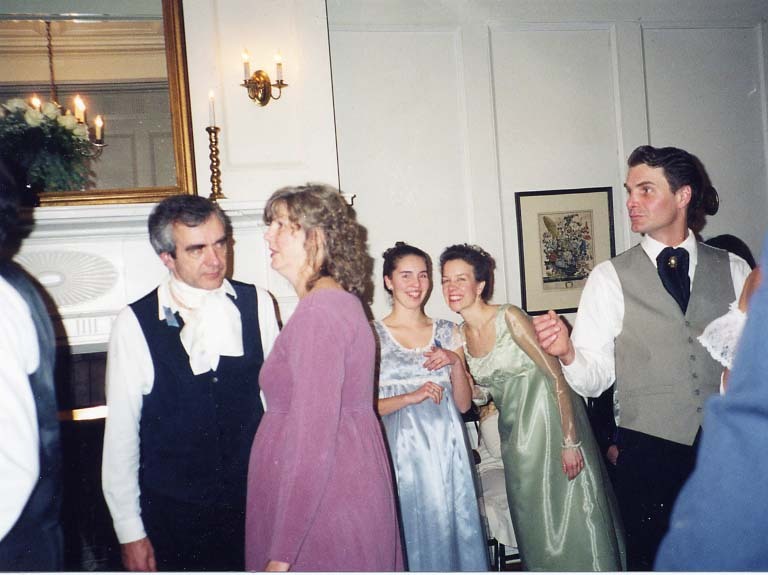 Folks from the community -- young, old, beginners, and more experienced -- learned the steps of English Country Dances that were popular in Jane's era, such as would have been enjoyed at Lorenzo's own gatherings. The culminating gala ball was a sold-out success, and wouldn't you know, host Russ himself cut a fine figure as the most accomplished of dancers. 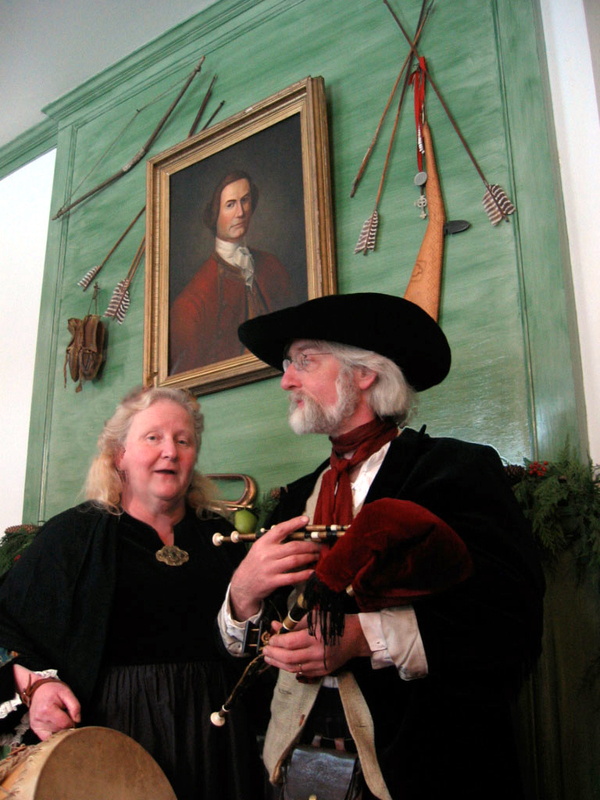 The unique project further enriched the community by extending the Lorenzo/Bromka partnership to include Cazenovia's college, schools, library, Lincklaen House, merchants' organization in an annual Winterfest Celebration. A full day of French programs, workshops and activities lead by Bells & Motley, including: a concert of French historic and traditional music on hurdy gurdies, a variety of French provincial bagpipes, including Breton biniou and bombarde (Breton bagpipes and rustic oboe duet), songs for dancing, singing, and dreaming; Instruction on historic musical instrument playing; Workshops in historic and traditional French dances of the provices; and musical instrument playing, and barbe-a-queue in July. A full day of performances and workhops of French culture, including music, instruments, and dance traditions, and highlighted by the artists' original musical theater performance "The Tale of Yanek & Heliotrope." Historic French music, dance, and storytelling performances and workshops given in various places, including Brittany, Alsace, and Sully sur Loire France; Lissberg, Germany; Brussels. Belgium; Istanbul. Turkey, and more! If you would like to receive further information about any of Bells & Motley's past special projects, or ideas for future programs, concerts, historic musical theatre performances, dance workshops, or extraordinary traditional holiday programs created especially for your site, contact the artists by email or by phone at 315-673-2995. Erie Canal Museum, Syracuse "Bells & Motley's Merry Tunes for Early America and Old England"
Zadock Pratt Museum "100th Birthday Celebration"
©2014 Sondra Bromka. All rights reserved in all media.